PA chairman Abbas says he's willing to work with Trump administration, blasts Netanyahu for "destroying two-state solution". 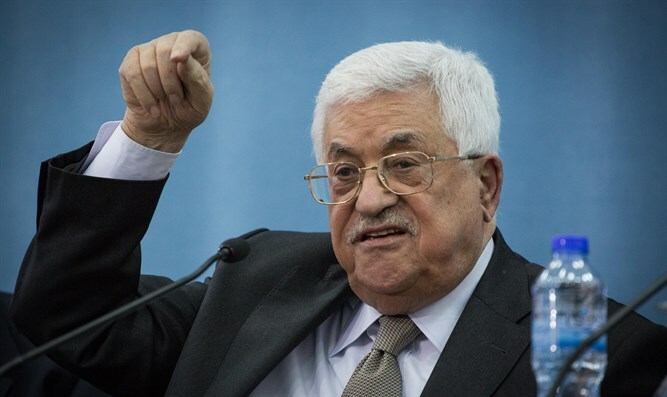 The Palestinian Authority (PA) on Wednesday evening reacted to the meeting between U.S. President Donald Trump and Prime Minister Binyamin Netanyahu. A statement from PA chairman Mahmoud Abbas’s office said that the PA remains committed to the two-state solution and is willing to work with Trump’s administration to achieve a peace agreement. The statement also welcomed Trump’s call during his meeting with Netanyahu on Israel to "pull back on settlements”. It said that Abbas “demands that (Israel) agree to (Trump's call), and that of the international community, to halt all "settlement" activities including in occupied East Jerusalem." An unnamed PA official was more critical, telling Kol Yisrael radio that Trump’s words were "the biggest disaster it was possible to hear from the American president." “What’s this two state or one state? Why not five states already? This is worthless talk," said the official, who added that Netanyahu is not the only player in the region and that Trump should also listen to the PA’s opinion on the issue. "If Trump would like to be in touch with us, we are here and not going anywhere," he said. Trump’s comments were in line with those of a White House official, who indicated on Tuesday night that the United States would no longer insist on a “two-state solution” to the conflict. "A two-state solution that doesn't bring peace is not a goal that anybody wants to achieve," the official said. "Peace is the goal, whether that comes in the form of a two-state solution if that's what the parties want, or something else if that's what the parties want. That's going to be up to them, we are not going to dictate what the terms of peace are going to be," added the official.